Before starting this discussion, lets agree that games are beneficial to your team building program. Then how do you find appropriate games to use. There are lots of games available on the Internet, in books and passed on through oral traditions. But not all these games are going to be beneficial to your team building program. social interactions – To increase the opportunities for the team members to build relationships the games should involve communication. It is fairly hard to play any game without some form of communication. So there must be more than just that. You want the game to get them talking to each other or discovering more about each other’s skills, personality, values and reliability. How the members should be involved the game depends on the teams working arrangement. It may be that these interactions should be as a whole team, in sub groups, triads or pairs. thinking – Games should involve a range of thinking skills. 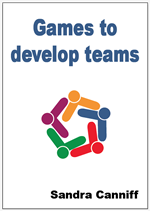 The main ones used in team building games are analytical, creative, lateral, logical and systemic thinking skills. An improvement in the use of these skills will lead to enhanced problem solving skills and innovation. These are two highly valued skills of team members. fun – This is a given. Games should be fun. If they are not fun then why would the team members want to participate. Just remember that fun comes in various levels from hilarious fun to deep satisfaction. movement – To take a break from formal learning a success, you need to get the body moving and doing something different. The amount of movement in games will differ by the type of game you want to use. Energisers should stress movement. Whereas, team bonding and closure games may limit the amount of physical movement but expand the amount of movement within the mind with social interactions and different thinking skills. engagement – There are two levels of engagement – captivate their interest in achieving the goal; inclusion of all team members irrespective of physical or mental impairment, gender, cultural beliefs or language fluency. All members of the team need to be engaged in each of the games. If someone is excluded they can feel less important and loss confidence in their role in the team. risk taking – Any games that are designed to achieve the above goals will require some risk taking behaviour on the part of the participants. It may be talking to someone you don’t know (ice breakers) or doing something silly in front of others or invasion of personal space. Your task in selecting games for your team is to determine what level of risk the team is prepared to undertake at the time that are going to use the game. speed – The game should quick: preferably completed in 10 – 15 minutes. The team members need to have a break and refocus but you don’t want to use too much time for this. The games should have goals that are accomplished quickly so there is a feeling of achievement or success at the end of this short time.